Preferred pricing for guest rates, food and beverage, and merchandise. 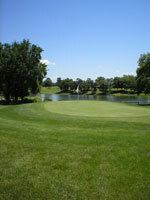 The Osawatomie golf course is a parkland golf course design offering two distinct nines. The front nine built in 1941 puts a premium on approach shots hit into target sized gently sloping greens. The back nine built in 1972 offers more generously sized undulating greens that put a premium on the players short game. These distinctions provide a unique golfing experience that rewards players with a complete and well rounded game. If this doesn't describe your game today, it most certainly will after time spent playing this historic course. Osawatomie golf course is known for its exceptional bentgrass greens conditions; and its recently renovated zoysia fairways provide a high quality playing experience from tee to green throughout the course. Former and long time golf course superintendent and general manager Brad Waggoner is credited with setting and maintaining high standards for the golf course that continue to this day. See for yourself why this short trip from the greater Kansas City area to Osawatomie golf course is time well spent for golf enthusiasts. Our friendly and helpful staff look forward to serving you next time you visit. See for yourself why this short trip from the greater Kansas City area to Osawatomie golf course is time well spent for golf enthusiasts.